Why discretes, analog and optoelectronics can impact the entire chip industry. Material and capacity shortages typically prompt changes in normal operating procedures, especially purchasing strategies. If the uncertainty regarding world trade policies and tariffs are added on top of the shortages, the impact results in unusual gyrations in industry sales data and possible misleading signals. 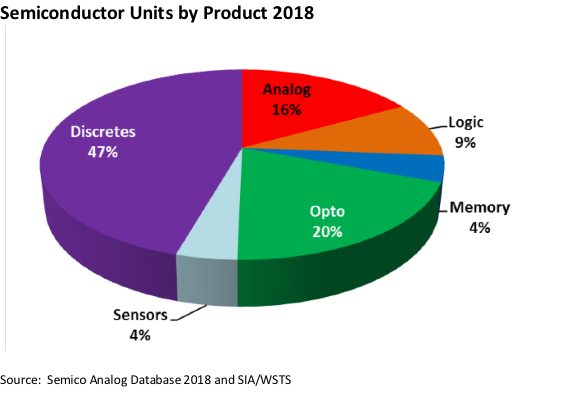 Discretes, analog and opto are the three largest semiconductor product categories in terms of unit sales. 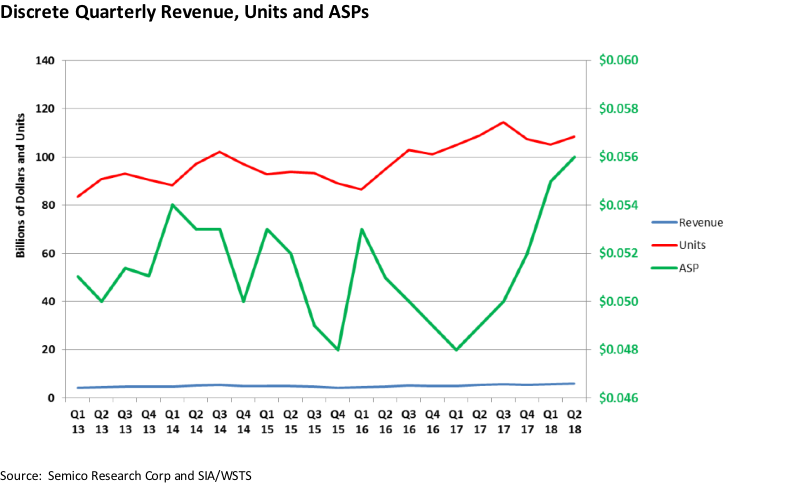 Let’s take a look at three product markets that dominate semiconductor sales in terms of units but are sometimes overlooked in terms of the impact on the overall industry. Discretes typically go unnoticed due to the product’s low price point and its consistent, seemingly monotonous use of mature technologies. 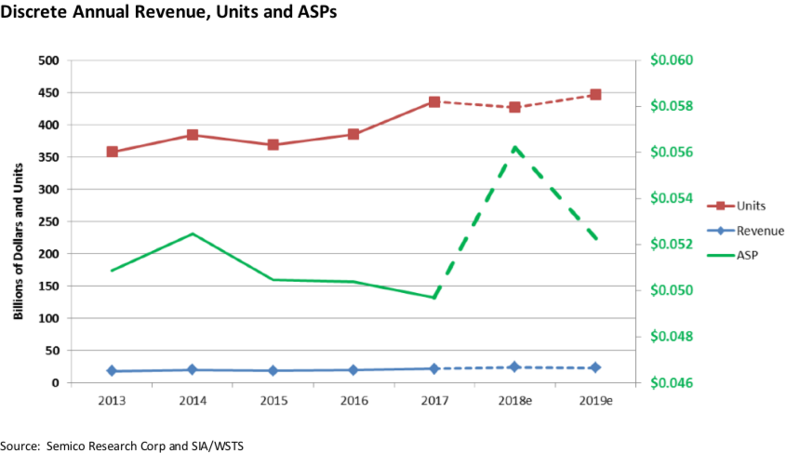 On an annual basis, the graph below indicates that discrete units have been growing since 2015 and annual ASPs have been declining since 2014. Semico’s 2018 forecast indicates a change in the unit and ASP trend lines. Units are expected to decline by 2% in 2018 as ASPs take a significant jump. But these numbers deserve a closer look and further explanation. A graph of monthly ASPs for discretes indicates that ASPs actually started growing at the beginning of 2017. Over the past 18 months, monthly ASPs increased 29%; 20% in 2017, and another 13.7% so far in 2018. Those are impressive growth rates; however, the full story related to discretes warrants a look at quarterly data over the past five years. 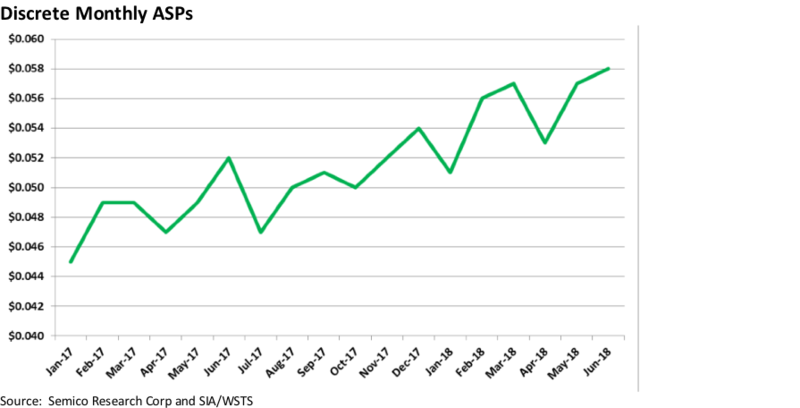 When viewed on a quarterly basis, the graph below shows that ASPs have been increasing for five consecutive quarters making it the longest period of increasing prices over the past five years. Semico expects unit sales to increase in Q3 2018, as it normally does in the third quarter, however; the third quarter increase will not make up for the unit declines in Q1, Q2 and Q4. Overall 2018 will end the year with a 2% decline in unit sales compared to 2017. Optoelectronics make up the second largest semiconductor product category in terms of units. Unlike discretes, optoelectronics are continuing on the path of declining ASPs while units continue to flourish. 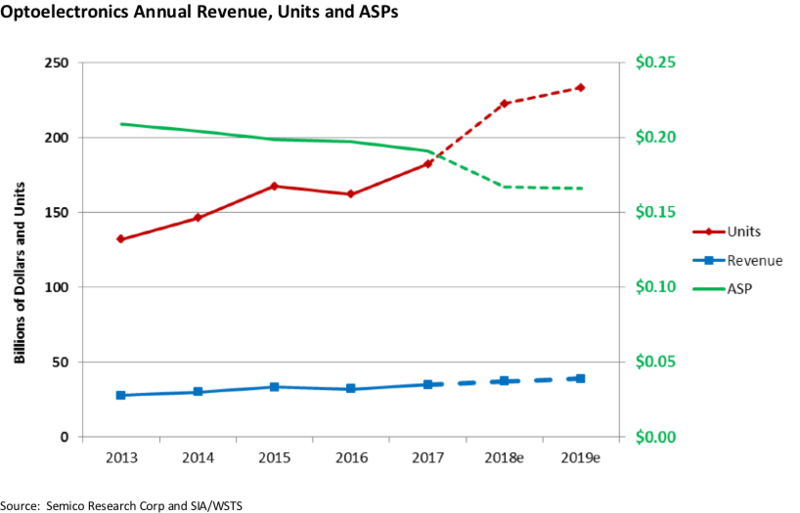 In 2018, optoelectronics units are expected to grow 22% while ASPs drop 12.6%, resulting in a 6.7% total revenue increase. The higher than average increase in units and decrease in ASPs is not that unusual for this product category but appears to be more exaggerated and isolated to certain product types. So far in 2018, laser transmitters and opto couplers and isolators have been the biggest contributors to the drop in ASPs, dropping 13% and 6% respectively, since Q4 2017. Laser transmitters are also experiencing an unusually high increase in unit sales and are on track to grow 66% in 2018. 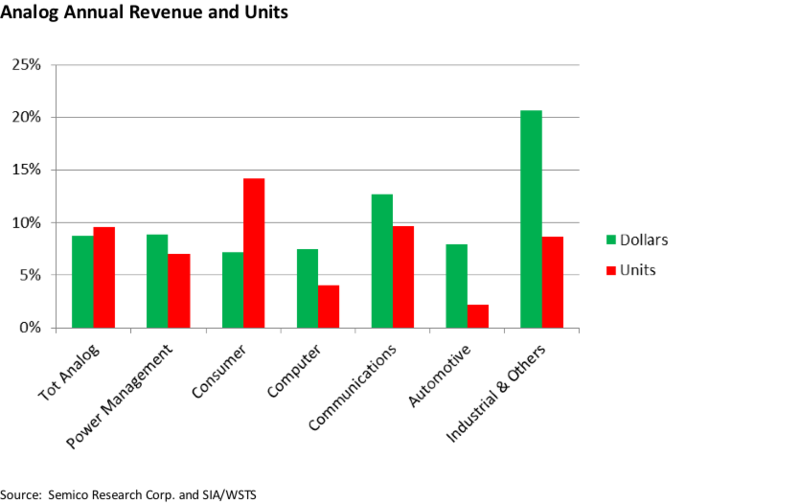 Light sensors experienced an odd run-up in prices at the end of 2017 but have fallen back into the normal range of $0.43. Finally, analog products make up the third largest semiconductor product group comprising 16% of all semiconductor units. These products are following a more customary growth pattern. Analog units are expected to grow almost 10% in 2018, with revenue growth expected to reach 8.7%. Key products that are contributing to the growth of the analog in 2018 includes power management, and five application specific analog categories. 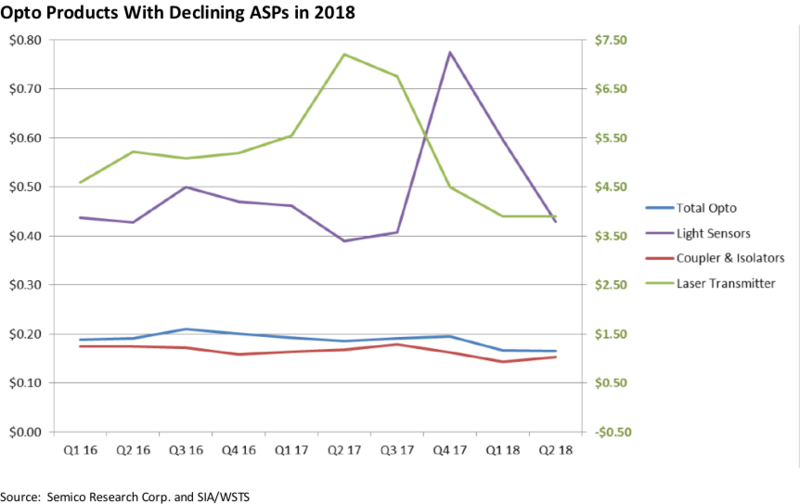 Breaking the data down even further, wireless infrastructure, is a small category but is expected to grow over 30% in revenues and 27% in units. In addition, computer systems and displays are expected to grow almost 28% in revenues and 23% in terms of units. These high volume semiconductor products are enjoying growing end market applications but the growth is being challenged by capacity shortages and rising material costs. Companies are choosing different strategies to address these conditions resulting in a variety of fluctuations in the market. Semico views most of the data gyrations as temporary and we expect to see a return to more normal patterns in 2019.